Thanks to its countless attractions, amazing entertainment, and breathtaking scenery, Barcelona proves to be an unparalleled vacation destination. During the holidays, this exotic city is even more beautiful with its elaborate decorations and festive activities. With all that Barcelona has to offer during the Christmas season, you’ll want to start planning your amazing holiday getaway this second! bizFlats Vacation Rentals wants to make your dream vacation a reality this holiday season by providing you with the best possible places to stay. Our numerous apartments, villas, penthouses, studios, and lofts offer generous space, luxurious furnishings, and convenient locations. Browse through our list of some of our best properties for a Christmas vacation and discover which one is the right fit for you to rent for the holidays near Barcelona! 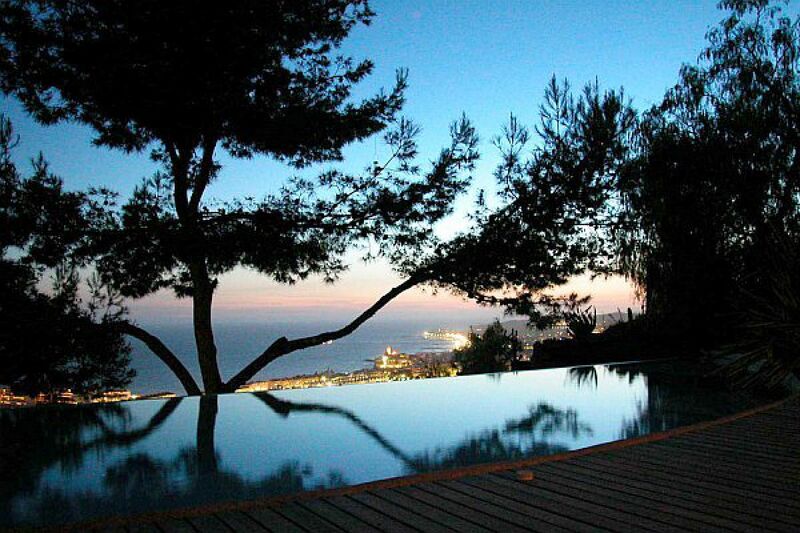 Lose yourself in bliss while you stay in this villa during the holidays near Barcelona. Located in a quiet and secluded residential zone of the Sitges Village, the gorgeous rental is just a 25-minute drive from the city. The Villa Upstairs includes 5 comfortable rooms, 4 complete bathrooms, and a spacious living room, complete with a working fireplace. Revel in the views of the sea as you relax on the terrace, which is furnished with table and deck chairs and surrounded by a colorful garden. You will always remember your stay in this peaceful haven, tucked away into one of the many mountains encircling Barcelona. Also located in the Sitges Village, the Villa Downstairs has 4 bedrooms and 2 complete bathrooms, with a nearby bungalow serving as a private area for two. The garden connects the two areas and contains a 16-meter swimming pool and additional hot tub, perfect for warming up in chilly weather! You’ll love residing in the heart of the mountains in this charming rental for the holidays near Barcelona. This cozy 2-bedroom apartment is nestled right in the heart of Barcelona! 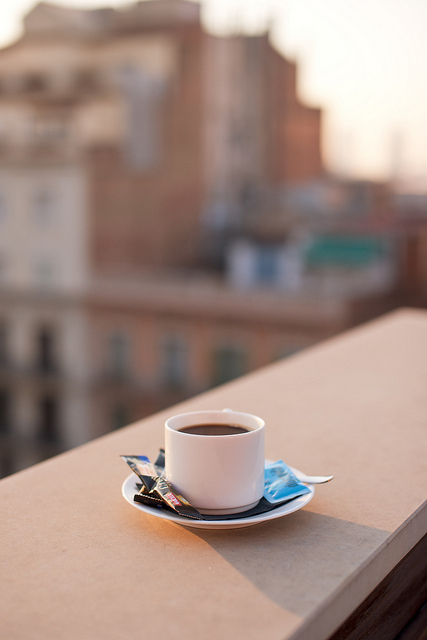 Enjoy a cup of coffee in the morning as you sit on the balcony overlooking the bustling city streets. kissMe also provides a fully equipped kitchen as well as a washing machine, smart TV, and WiFI. Its modern furniture, lighting, and decor create a welcoming environment for your home-away-from-home. Don’t miss the opportunity to lodge in the center of this exciting city! This dreamy apartment is directly adjacent to the most dynamic part of Barcelona! Parsifal is positioned just 20 meters from La Rambla, a lively part of the city filled with must-see attractions as well as excellent dining and shopping. The apartment contains 3 bedrooms, 2 complete bathrooms, and a large common area divided into 3 different spaces with an abundance of comfortable seating for everyone. Spend your holidays near Barcelona in this very close by and luxurious oasis! Come Stay with Us at bizFlats! Now that you’ve seen a few examples of our amazing vacation rentals, check our availability and book a stay with us today! Our rentals encompass a wide range of sizes, from an intimate nook designed for a romantic getaway to a sprawling flat with enough rooms to sleep your entire family. You will love spending your holidays near Barcelona in one of our sensational rental homes, specifically fashioned to accommodate all of your needs during your dream vacation. Barcelona is the dream vacation destination for many reasons; one of which is it’s amazing to visit all year long! If you’re planning a vacation to Barcelona in winter, you might have a few questions regarding what to wear or how to spend your day. Read these tips to help you schedule your Barcelona winter day itinerary. Bundle Up- but Not Too Much! As you’re getting ready to start your Barcelona winter day, you’re probably wondering what clothes are best suited for the weather. Barcelona winters are typically blessed with beautiful weather. Temperatures are mild; generally they tend to be around 50 degrees Fahrenheit during the day and around the 40s at night. The days are usually sunny with rare glimpses of rain (although there might be a good many overcast days). So grab your jacket and scarf but leave your heavy winter coat behind! Barcelona prides itself on its coffee. With bold flavors and higher amounts of caffeine, a cup of Barcelona coffee is the perfect way to start the day. -Café amb llet: Best enjoyed with a light breakfast, this morning delight is equal parts espresso and steamed milk. -Un café or café solo: A simple shot of espresso with a thick layer of foam, usually saved for the end of a meal. -Carajillo: A café solo with some added brandy! Not for breakfast though- this alcoholic beverage is generally made to accompany bigger meals. Along with your morning cup of joe, you need some wholesome food to give you enough energy for your Barcelona winter day. A traditional Catalan breakfast can be a large, substantial meal. While some locals might just grab a cup of coffee and a croissant, many indulge in hearty breakfast sandwiches. The Pa Amb Tomaquet is another traditional part of a Barcelona breakfast; it consists simply of warm bread moistened with ripe tomatoes and drizzled with authentic olive oil and sea salt. Use Your Afternoon to Explore! This region of Spain is positively bursting with things to do: hikes featuring breathtaking scenery, museums honoring the history of the city, and more places to shop than you’ve ever seen before! Take your afternoon to wander through museums and art galleries or rent a bike to see numerous parts of the city. Barcelona is covered with various bike paths for you to tour historical monuments, beaches, and parks. Spain is home to many of the best restaurants in the world. Treat yourself to an amazing dinner after your busy day of exploring Barcelona. Many places here offer a very unique cuisine made from the freshest local ingredients and provide views of the surrounding city to accompany your amazing meal. Don’t let your Barcelona winter day end after dinner, though! Barcelona has a bustling nightlife, perfect for letting loose and concluding a long day. No getaway is complete without comfortable accommodations. bizFlats offers rentals of apartments, lofts, villas, and more so you can fully relax after a long day in your home-away-from-home. Check our availability and find the perfect place for you! The eyes work tirelessly while exploring new places, constantly darting from side to side and up and down, trying to take in all the dazzling sights and scenery. Maybe you’re a history buff who gazes in awe of ancient buildings or an art connoisseur who stares diligently at art displays to interpret their meaning. Perhaps you’re an outdoors expert who is constantly gaping at the sight of breathtaking mountains… or you prefer to bask in the sun and watch the waves roll onto the beach. Whatever you like to see, Barcelona has the perfect attraction for you! Investigate sights that interest you or discover a new passion within the vast list of what to see in Barcelona! Joan Miro´ Museum: Learn about the famous Joan Miro´ and observe rare paintings and exhibits in this unique museum. Barcelona City History Museum (MUHBA): Study ancient artifacts as you discover more about Barcelona’s history and how it has developed since its founding. 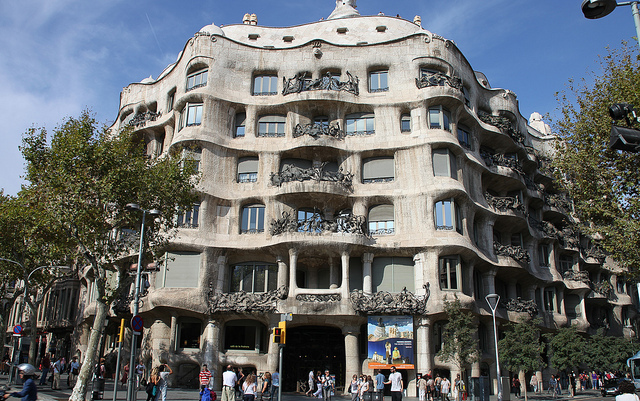 Modernista Art and Architecture: Many modernista architects, such as Antoní Gaudi, have left their mark in Barcelona in the form of countless, breathtaking buildings all across the city for the public to admire. Barcelona Ramblas: Once a rushing river, this significant part of Barcelona is now the most famous street in the city, filled with businesses, historical sites, restaurants, markets, and more! Since it is a city surrounded by hills, Barcelona is home to many beautiful hiking trails. If you love the outdoors, lace up your hiking boots and investigate these magnificent scenes of nature. Montjuïc mountain: This towering hill, which historically served as a defense for the city, now contains gardens, parks, hiking trails, and even cable car rides to view the city from above! Collserola Park: An ideal area for biking, this park has picturesque views of the city, the Mediterranean, and the countryside. Montserrat: View the famous Montserrat monastery before hiking the peak of this mountain, which is known for possessing the best view of Catalonia. Pyrenees & Montseny Mountains: You should reserve an entire day trip to fully appreciate what these mountains have to offer; you’ll find countless parks, trails, and views of the mountains as well as ancient towns and buildings. The beaches of Barcelona are truly a sight to behold. Over four kilometers long, these beautiful beaches are spread along the Mediterranean and include multiple coastal towns and marketplaces to explore. Many of these areas have a thriving nightlife as well, making these beaches a must on the list of what to see in Barcelona! Sant Sebastià: The longest and arguably the most popular beach in Barcelona, Sant Sebastià stretches 1,100 meters long and possesses many sporting clubs for sea-related activities. Nova Icària: Closeby to the Olympic Marina, this beach has a wide variety of restaurants in its adjoining town, offering some of the best Barcelona cuisine. Mar Bella: This active and bustling beach is best known for its watersports. Visitors and locals alike here can be seen windsurfing or kayaking; there’s also a perfect area for joggers and cyclists. Barceloneta: The oldest beach in the area, Barceloneta is known as Barcelona’s classic neighborhood by the sea, where people from far and wide come to enjoy seafood in this traditional fishing district. Come and Stay with Us at bizFlats! Now that you know all about what to see in Barcelona, check our availability and book a vacation with us today! We offer a variety of different penthouses, studios, apartments, lofts, and villas, all designed for you to get more living space for less money than a hotel. If you’re looking for a Christmas celebration unlike any other you’ve ever experienced, Barcelona is the perfect place for you this holiday season! December is an ideal month in this exotic region; the Barcelona Christmas weather isn’t too chilly, holiday activities are in full swing, and the streets and buildings are lavishly decorated. Exciting festivities, traditional culture, and welcoming locals make Christmas in Barcelona a truly magical time of year. The Christmas season in Barcelona officially begins on December 8th, which is known as the Feast of Immaculate Conception, a day centered on the belief that the Virgin Mary was conceived without sin. The majority of families in Barcelona begin decorating for Christmas on this day. Usually the most prominent Christmas decorations in the typical Barcelona home are the Nativity scenes (complete with the traditional caganer) displaying the stable of Bethlehem. Christmas Eve (La Nochebuena) is observed with an extravagant dinner to celebrate the birth of Christ, and Christmas Day is celebrated December 25th with gifts and meals; most businesses are closed to honor this day. The end of the Christmas season is marked by Three Kings’ Day on January 6th; this holiday, even more widely observed than Christmas Day, represents the day the Three Wise Men arrived to visit Jesus and is celebrated by a large parade the evening before. Barcelona Christmas Market: Christmas fairs and markets are a must-see during Christmas in Barcelona! Some of the most popular markets are Fira de Santa Llúcia, which is filled with beautiful displays and performances, and the Fira de Reis, where you can find a wide selection of goods, candies, and toys (mostly handcrafted). Many other fairs and Christmas markets are scattered amongst the villages during this season. There’s also the Festival de la Infancia, a fair with activities specifically for children, such as storytelling, games, and crafts. Skating: Another popular activity during Christmas in Barcelona is ice skating; Catalunya Square, an iconic plaza surrounded by monumental buildings, is transformed into a temporary ice rink during the winter seasons and attracts visitors of all ages. 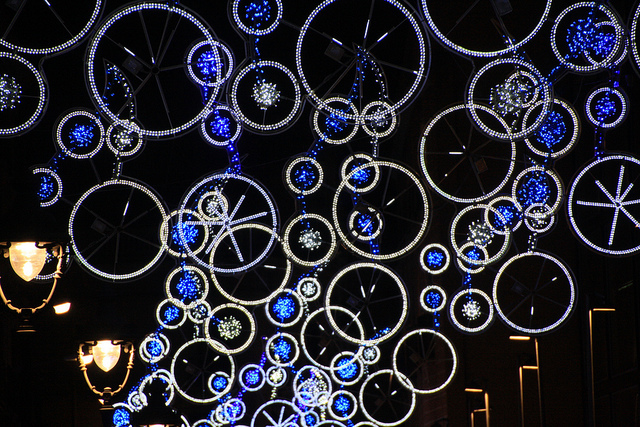 Lights: Barcelona is well-known for their light exhibits during the holiday season! Almost 300 streets are adorned with dazzling light displays and every district of the city presents its own towering Christmas tree. Special Events: The Harbour Swim (Copa Nadal) is a swim across Barcelona’s freezing harbour on Christmas morning. This tradition dates back to 1907 and has been a sight for spectators to enjoy every year since! The Three Kings’ Parade is another famous Barcelona Christmas tradition that always occurs on January 5th. This three-hour procession begins at 6:00pm and follows a 5 kilometer route. Various artists, such as musicians, dancers, and circus performers, all participate to create this beautiful and traditional festivity. Celebrate The Tradition of the Barcelona Christmas Log: One of the most unique aspects of Christmas in Barcelona is the tradition of the Caga Tió (the Spanish Christmas poo). A log with a cartoon face is placed by the hearth, and the children of the household present food to the log in exchange for gifts that it poops-out. If any of these sights or events have peaked your interest, Christmas in Barcelona is the perfect winter getaway for you! bizFlats offers a wide assortment of different lofts, studios and penthouses, apartments and villas to rent in spectacular areas of Barcelona. Come experience luxurious living in one of the most exhilarating places on earth. New Years in Barcelona is an amazing experience, as well!